When taking or giving formal lessons of any kind, the relationship that exists between the student and the teacher has easily as much to do with what you learn as the material itself. There’s always a critical balance in the relationship between the teacher and student, even in school, but when it is one-on-one, the closeness and the effect of each person on one another is even more acute. 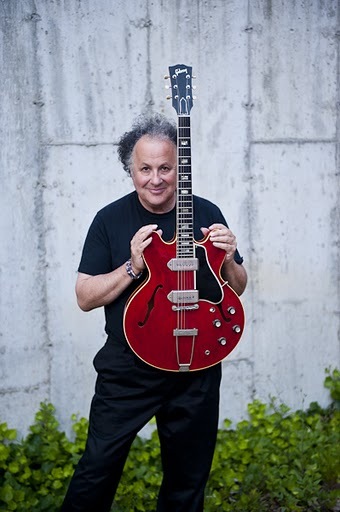 I suppose a lot of you feel closer to me as a teacher due to my exposure through all my Gibson lessons and my past Hot Licks video and audio tapes, so in a way, we also could have a closeness that can rival even a private lesson. I know that through the many years I have taught, I have developed many close relationships with my students, many of whom have already become lifelong friends. One thing is for sure, I never made any enemies teaching, and I think that is because I first of all, give of myself and my knowledge completely unselfishly, and, I also convey a lot of interest in what I feel the student really needs. This closeness and true caring is what can really set apart a real teacher from just another one. Above all, the student must feel that you, the teacher, really care, and that you also have a vested interest in furthering their abilities. After all, a student is not going to keep coming back for more unless they feel as if there has been real progress made under your tutelage. And of course, on the other hand, you really need to have the students coming back for more……it’s almost as if the teaching action itself is also a kind of entertainment, where you “leave ‘em wanting more!” It’s true….your teaching must be entertaining as well as informative, and there has to be a nice balance achieved between the two. If you do become somewhat “entertaining” during your lessons, it’s important to remember that you always must keep the lesson focused, and be sure to “reel it in” and not let the student become too confused nor distracted. Believe me, the student will forever thank you for this “caring” approach, and for the teacher there is nothing more rewarding than seeing a happy student, and that feeling that comes after a lesson where there was a good teacher/student interchange. The first lesson is always a critical “feeling each other out” kind of situation, in which I often give the kind of lesson that is more of an “overview” than anything else, but this has also the purpose of establishing our relationship, communication, and even simply to see how good a “fit” this particular combination can be. Sometimes unfortunately, it turns out to be a non-stop struggle, but thankfully, those kinds of lessons rarely continue for very long! So good luck in finding the right combination, for as you’ll see, there’s nothing like a good relationship between student and teacher. It can only help you both! Taste and restraint, and the way you not only use your notes wisely, but what you listen to, are really important building blocks for all you can do. Lots of people are always talking about how so many things are “what we are born with”; that we really forget to understand how much of what we really have and are able to do artistically is really acquired over our lifetimes, and is really far from something we are born with! I do believe that some of us may be more prone to greatness and fine taste than others from the get-go, but who is to say if any of this would ever come true if not for it being encouraged and nurtured at the right moment?! I really believe we are a product of the combination of these things, and the “taste” we end up having is a product of countless experiences and input we may have gotten. And then there is the simple fact of “influence”, and what that can mean in terms of our decisions when it comes to what we end up loving to play, or loving to listen to. I love to listen to music that stirs my soul, and that is filled with notes I can “relate to” in terms of my own playing. I always say that my interpretations of other people’s songs are more how that song “comes through me” as opposed to how I may have worked hard to “find” a new way to do it. I rarely have to go through that process, rather, I artistically “cut to the chase”, and simply play what I truly “feel” and how I truly have assimilated that particular piece of music. It’s hard to really put into words, but it’s the purest form of music making; really similar to actual composition. And composing is really what we do every time we play a solo, for example. From that very first note, we are making a musical “commitment” to what becomes the outcome, and final note of that very same solo. In the course of this “solo”, we must invoke all kinds of decisions of “taste”, right on the fly, as it’s being created. So, the next time you really start to play, listen or create something new on your own, see just how much of what you put into your music is a decision of “taste”. I think if you really examine what you’re doing, you just might surprise yourself at how many things went into the whole process! Happy creating! Sometimes, those of us who do teach for a living must be very careful about whom we teach. There are of course, many factors involved in whether or not you and the students are a good “fit”, and many of them intangible, but still there are some guild lines you should be on the watch for. One of the first things I truly look for is for the kind of “ear” the student may have. Usually when a new student comes to me for lessons, I can read their strengths and weaknesses quite easily, but I still like to ask a few questions over the phone on our initial conversation. Of course, I always ask the obvious things; you know, like “how long have you been playing?”, or “what kind of music do you like to play?” things like this, but then again, many of my students know who I am and what I’m about guitar-wise, so it’s fairly easy to sense what they may be seeking in terms of guitar knowledge from me. But what I am really looking for is a true musical “spark” that I can tell they have which immediately tells me what kind of progress I can expect from them. I imagine all teachers of many kinds, even the ones in grade school, if they’re good, love to see that “spark” in a student for sure, and they instantly know that this is a kind of student they will find real joy and pride in teaching. I’m really the same way, but I love to give everybody the benefit of the doubt when it comes to their ability to learn and absorb things, and only when I feel that there is less hope than I thought, do I start to handle them really differently. It’s also incumbent upon me to be able to diplomatically describe to them just what it is I feel they are lacking, and to not get too harshly critical of them. Everyone deserves a fighting chance, and you really never know just when that missing “spark” may suddenly ignite in that particular person! If it even gets to the point where you and your student have really decided that “enough is enough” and that the fit just isn’t right, it becomes quite obvious for sure, and you’re both better off calling it quits with each other. The part I don’t understand is when some students stop just as the sparks are really starting to fly, and I feel like they’re finally really “getting it.” That’s one I’ll never really get! But regardless, the process is a real fun and rewarding one, and should be this was for all student/teacher relationships! Happy learning and teaching! 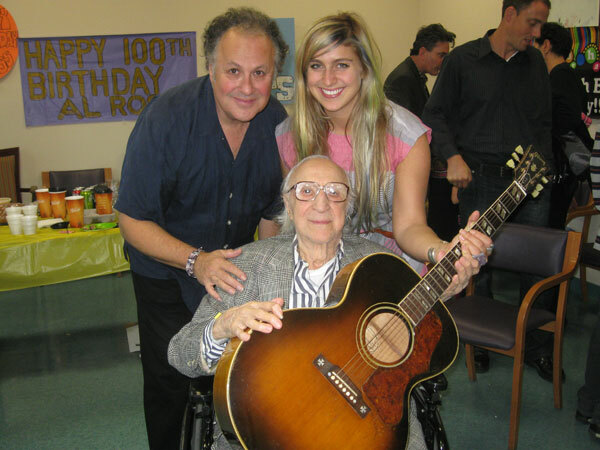 More on My Father's 100th Birthday! Talk about once-in-a-lifetime experiences! My Dad turned 100 on Oct. 19, and all the well wishes from fans and the folks who came to see him, both family and friends was really quite an incredible moment in time that continues to give! It was, of course, his encouragement that led me to playing the guitar, since he was always such a lover of Flamenco and Classical guitar music. I was already doing quite well on the violin for 2 years, but the rigidity and stiff structure of how it was taught and learned was really not for me, and I can remember feeling a bit “confined” by this old school approach that was supposed to be followed. In the meantime, I was starting to pick up the guitar by ear immediately, and armed with the physical ability I was getting for handling strings from learning violin, switching over to another string instrument really seemed like a natural transition for me. My Dad, who is a well-known New Yorker Magazine cartoonist under the pen name Al Ross, was always the kind of guy who did and learned things on his own. He always spoke of artists that inspired him with their work, ad who influenced his art, such as Picasso, DeKooning, Pollock, Cezanne, Rodin, Van Gogh, Roualt and many more who he’s speak of the same way I speak of Mike Bloomfield, Buddy Guy, B.B. King, John Fogerty, Chuck Berry, Carl Perkins, Clarence White and Merle Travis, among many others. So in a way, these are our teachers….the ones who came before and paved the way so we can take that influence and fly with it. Just a little “snapshot” of a new player’s style, and that would be all I’d ever need to help push my playing in a new direction. It’s still true to this day, whenever I hear a new and intriguing player I love. I don’t need to “sound like them”, but I may find some aspect of their technique that I can really see becoming a part of what it is I do overall. Of course, growing up in a household with a cartoonist/painter father, and a ten-year older than me brother who was also an artist, I couldn’t help but find myself in the midst of all kinds of creativity that would eventually become part of my musical prowess, as well as other creative outlets for me such as the writing I love to do, and all the film and photography work I put into my Hot Licks series. So in the end, it’s really all about the encouragement you get! I can remember when I first moved to my tiny apartment in Woodstock, NY, to really begin my musical career in earnest, watching my Mom shed a little tear, and knowing that no matter what I was about to embark upon in this new musical adventure, their love and guidance and most of all, approval, was always right there to back me up, and to catch me if I fell! Truly a real lesson in life, and how to love and to pass it on! Though none of my relatives ever really pursued music as a career, or even had an ear at all, he would always listen to Flamenco music and tons of Flamenco and Classical guitar on the stereo. This music permeated the household at all times, and even though I was fast becoming proficient at the violin, he noticed that I was picking things up on a two-stringed guitar we had lying around the house. I can still hear his words as he said “Arlen, you play the guitar, I can just picture it for you! Forget the violin…” This is really a true story, and it was as if he could see into the future and predict that the guitar was destined to be in my hands forever. Our apartment was always filled with art, the creation of art and always the sound of guitar music too, so it wasn’t long before I joined all of that with my own sounds. He was always taking me downtown, and during the beginning of the vintage guitar craze, around ’66-67, he would take me to Dan Armstrong’s shop on 48th Street, and we’d fall in love with all those incredible Les Pauls he had all over the place! My Dad right away aesthetically appreciated all these guitars as the works of art they are too, and he was always encouraging me to try to buy the best, even though we had so little money! Somewhere in the Bronx, there’s a music store I used to visit every day on the way home from High School, where I must have a $10 deposit on at least 20 guitars we could never pay for! But that day in 1967 did come, when he and I discovered my 1952 Goldtop Les Paul at a store called Eddie Bell’s, on 49th street in Manhattan. I still remember the excitement I felt when I finally held that beauty in my hands, and how approving and proud he was of me and that guitar being put together! This love of music and art and therefore life that he instilled in me is certainly no small thing. And when it’s given with the kind of love he can give, it’s something that I only can hope all of you can one-day share with your parent, or with your children as a parent! There’s no feeling in the world like truly getting up in front of a crowd, and leaving them wanting more and more. I love getting on that stage, and really letting loose, and while always keeping the music first and foremost, I do enjoy and love to interject a good deal of “showmanship” into the equation for sure! This is something that gets learned at a very young age, and to this day, my brother says I wouldn’t have become a performer had it not been for the “sunken living room” we had in the apartment in the Bronx, enabling me to say good-night to everyone, and to put on a little show to all those folks “down there” in the living room audience! Also what I loved was how as flamboyant and as crazy as this “Rube Goldberg setup” was, it was all about the music first, and the incredible sonic blast of creativity we were all being treated to! I always like to interject some humor into my playing and into the shows in general, and even do some crazy things onstage, like playing “Sleepwalk” with both regular guitar as well as Lap Steel, and sometimes a nice accidental joke is when I can’t get back to the steel fast enough for the famous harmonic lick, so I point at the Lap Steel, as if to say “take it!” This happened to me the other day, when I turned the fact that the mike onstage was about 40 feet from wherever I seemed to be at the time, so I’d have to do this wild “run” up to the mike, always just in time!!! So, in actuality, though many folks plan things out, the real “showmanship” often comes from an accidental discovery such as these last two I described. So be prepared for whatever may happen onstage, because you’ll never know just what may work itself into the act!!! Have fun, and always be a showman!! Been working with a lot of students these days on the importance of tonal recognition, and it still baffles me just how many simply can’t recognize some of the most rudimentary of changes! What I mean is being able to recognize a minor from a major for example or a seventh from a sixth. I think what is happening here is the simple fact that their actual “mechanism” for this recognition of tones just hasn’t been “switched on” yet! I mean, it’s a basic human ability to recognize different tones…we use it in speech every day, and in recognizing for example, the difference from the downstairs bell and the front doorbell! Still, it becomes more or less a skill that we all eventually must cultivate to become complete players. The way in which I teach this is to get them to recognize the most obvious intervals, such as a minor or a seventh. I then point out examples of where it is so obviously already a part of their knowledge that they are literally forced to assimilate this information. Then, once the tonal recognition occurs, we try to actually put it into action together, so that in the actual act of playing together in a sort of “jam”, I can call out and point out the areas where what I am talking about occurs! This kind of “call to action” is so critical in the learning process, and the need to put a certain musical rule in its proper place is sometimes the only way for me to best “drive home” the idea I’m shooting for. Most of the time, after this occurs the student seems to really take it to heart, and their reaction is usually something like “that was so simple, I really knew that already!” And that’s what I’m talking about…tapping into a lot of the knowledge that is really already “there” in most of us who play, I just want to properly encourage the learning process to become more self-propelling for them. In the end, it really becomes what you do with your “inner voice.” When we are playing any instrument, we are just as much singing as when we are using our mouths, and the ability to “tune in” to that part of us, and how it translates onto the fret board is crucial! So, be sure to listen to that voice you have inside of you…every time you play, it’s right there, trying to tell you right from wrong, and good from bad. Follow its advice, and you’ll surely move forward as a true player! "Giving It All Up" Onstage! We all know that seeing performers who really put it all out there onstage makes the concert experience even more rewarding, and I’m sure many of you already know what that feeling is like onstage for yourselves. I for one, am someone who is never really satisfied unless I know I’ve given it “my all” in a performance. It seems to almost be a kind of addiction once you’ve really gotten used to, and hooked on, that feeling. It’s hard to explain, but when the communication is right between you, the other players and the crowd, and other things such as the sound fall into place nicely, you can really have the makings of a perfect musical experience. The funny thing is, that for me, I never really know where it’s going to happen. I can have an even more intense musical communication and purely emotional experience in a lowly basement bar in Finland, where they may never even remember my name, as much if not more, than on some grand stage in a fancy arena, where all the conditions are right. Sometimes it’s just better to be “down and dirty” with the crowd, on an almost one-on-one approach where the connection is so intense. I have even experienced this kind of intense connection during clinics, where you can have hundreds, even thousands, as I did in Australia, simply hanging on your every note and word! This “giving it all up” onstage was something that got into my blood at a very early age. Even as a sideman, I quickly learned how to essentially “steal the show” ad make the audience come to me, as it were. I was a front man with my own band, Steel, a couple of years before I became a sideman in Woodstock, and this progression set me up to be very natural and also quite intense onstage, regardless of the role I was playing. It’s an amazing feeling to have, and it’s one of true musical “control” where you feel as if you can do no wrong once you’re up there on that stage. I believe it’s really something you should strive for, even though there have been great “laid back” performers. Believe it or not, many times, those “laid back” folks are really being just as intense as the ones who seemingly “put out” more than most. For example, my late great friend John Entwistle of The Who, was always looked at as being so aloof onstage because of all the antics of the other three Who members, but without hi true intensity while performing, and what he put into that music, those performances would never have been as intense as they were! So whether you’re the “laid back” type onstage, or the really flamboyant type, make sure first and foremost that it’s real onstage before you start to put that intensity into your shows….not only will the audience be let down if it’s not, you certainly would be too. Happy performing! Back in the old days of actually making records, you know, those archaic dinosaurs of a by-gone era, the order in which songs were placed and heard was a very critical and often discussed topic when putting the final touches on an album. This was very important in the pre-cd era, since every record had 2 sides, and the musical thing you were trying to “say” with your album had an awful lot to do with the order and pacing of your songs. I am currently working on this with my new album, and it’s really an interesting process. I am going vinyl with the first run of this record, so I have to really think of not only the pacing, but the fact that there are two sides to this thing really changes the whole “ball game.” The trickiest aspect of this phase of making the record is how many different “bags” and genres I’m truly working in on this record, regardless of how subtle those differences may be. No matter what, the differences become fairly well-pronounced when you are thinking of doing all of this pacing of an album. There are even some times when it seems to me as if one song just leads right into another, which evokes some of those records from the days or when albums had a connecting “theme.” This new album I am doing, called All Tricked Out works though many genres, as well, and even seems to have “mini-themes” woven through it, that can be helped by the actual song order and pace of the album itself. As I’ve been going through the songs it becomes incredibly evident that while I was composing, arranging and performing these tunes, there were certain connections that these songs had that maybe even I wasn’t aware of. This can be in the form of thematic approaches, melodies, chord structures and certainly the fact that the music essentially captures a moment in time for me, which is something that we all want our various “art forms” to encapsulate. I guess this is the most important thing to me; that the record really embodies my particular approach at that given time. The worst thing we ever want to happen is for our recordings to sound all disjointed, and to sound as if they’re “put together” from too many session and studios and various musicians all over the place. So wish me luck on my continued adventure with this album, and good luck on your recording adventures as well! Think I’ll jump in the car right now and put in that cd to listen to my latest mixes and song order! Amps are, seemingly, the biggest dilemma and conversation piece in the world for guitarists. It makes sense, since it’s the one “other” part of our rig that truly completes the picture, but has less of a “passionate” relationship to all of us than our guitars do. Amps also do so much to “colorate” and change the sound of what we all do, that it really does become a major decision as to which ones we really choose. I guarantee you that if you put some guitarists together in a room and then left it open to discussion, the #1 topic will always end up being amps. Yes, there will be lots of poetic waxing about their love for their guitars, but the technical aspects of amplifiers will always win out, as they all fall into “talking shop!” This isn’t necessarily a bad thing either, as there is a lot to learn about the “amplifier question”, and it takes a lot to discover which is just right for you. I personally have never been into having a lot of amps. A lot of guitars yes, but I have always felt that a smaller group of amps would do me just fine. My general criteria for what amps I like makes me tend to gravitate to more of the kind that I feel give me my most “natural” sound. This means that what I expect out of my guitar, I also expect to hear coming from my amp. I tend to shy away from amps that alter my sound too much…after all, I’m playing the guitar, not the amp, and I just want a pure sound from my amps with a limited amount of natural distortion. There’s certainly no question that I prefer all-tube situations for that very reason of natural sound and distortion, but even still, there have been a few “solid state” amps that have really surprised me with their warmth and trueness of tone. If I were to get into a little bit of diversity with my amp collecting, I would certainly expect to get a few more interesting tonal approaches in my arsenal for sure. It’s also a really good idea when you’re recording to have a few amp choices at your disposal, which was what I was more open to in my latest recording, where instead of my usual one or two, I actually used about four different amps for various sounds. There are many great amps around these days to choose from, and as is the case with guitars, many manufacturers are “getting back to their roots” when it comes to building hand-wired, sophisticated and durable amps. I’d really check around at what works best for you, but I’d always try to keep in mind what I said about making sure the amp lets you say and express what you need to say on that guitar of yours! Happing amp searching!